Displaying a wide range of influences, past efforts from Coheed and Cambria have painted them with the brush of progressive metal, alt rock and — due to a handful of their less aggressive tunes — emo. Whichever era appealed to concert goers the most, Coheed and Cambria gave a taste test of all of their memorable discography. Despite smaller attendance and some discomfort toward the finale, Coheed and Cambria's venture in proved valiant. Unveiling themselves slowly from backstage, the members of Coheed and Cambria commenced with "The Dark Sentencer." 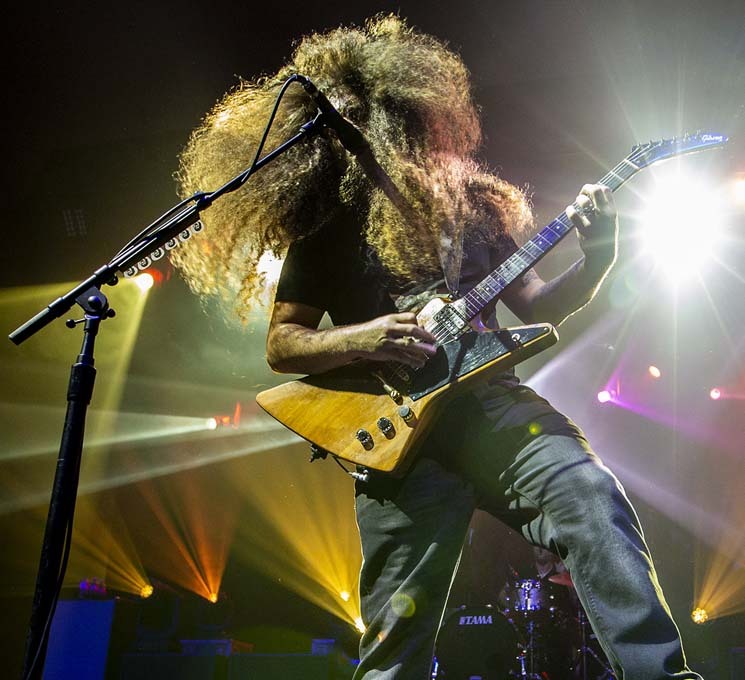 Resembling a heavy metal Cousin It, frontman Claudio Sanchez's face was rarely seen behind his mammoth amount of hair, yet his voice penetrated those many layers of the curly thatch. Clean and crisp, Sanchez displayed the diversity needed from one song to the next. Coheed and Cambria have experimented with a multitude of sounds and musings during their 20-year tenure, and various inspirations gave the performance a level of unpredictability, as they went from heavy tone of "The Crowning" to the lighter and more pop/punk beat of "Blood Red Summer." Topped by the expert sound quality and the steady musicianship from each band member, the setlist carried out was an impressive exhibit of the band's abilities. Touching on a large portion from their earlier works, including "Ten Speed (Of God's Blood & Burial)" and "Wake Up," the nostalgia levels in the venue were high. Toward the tail end of the performance, Sanchez seemed to have a fading voice during one of the group's newer tracks, "Unheavenly Creatures" and seemed a bit lost on stage while trying to maintain his footing. Powering through the minor hiccups, Coheed and Cambria prevailed through the remainder of the song before taking a brief exit from the stage. As the group entered back to the stage for their one song encore, Sanchez was equipped with his Gibson Doubleneck guitar, knowingly used for the group's massively successful hit, "Welcome Home". During the song, it became apparent that Sanchez may not have been in his best health, as he seemed to struggle to keep his place in the song, missing some guitar and lyrical verses. Fans were happy to step in a lend and hand as everyone belted absent lyrics while Sanchez regained his composure and through a notable effort made the remainder of his performance memorable. As the lights dimmed and the closing verse of "Welcome Home" were sung by the audience, Coheed and Cambria slipped off stage in darkness, leaving fans a bit concerned but still relishing in the high points of the evening. Coheed and Cambria "The Dark Sentencer"